"These perfectly golden brown, toasty, buttery Parmesan-crusted grilled cheese sticks are filled with 2 ooey gooey melted cheeses, plus a few more surprises!" Spread 1/2 teaspoon mayonnaise onto 1 side of each slice of bread. Sprinkle 1 tablespoon Parmesan cheese over mayonnaise layer, pressing cheese firmly into the bread. Combine remaining mayonnaise, Cheddar cheese, Jack cheese, green onion, garlic, and cayenne pepper in a bowl. Flip 1 bread slice over so the Parmesan layer is facing down, and spread Cheddar cheese mixture onto the bread. 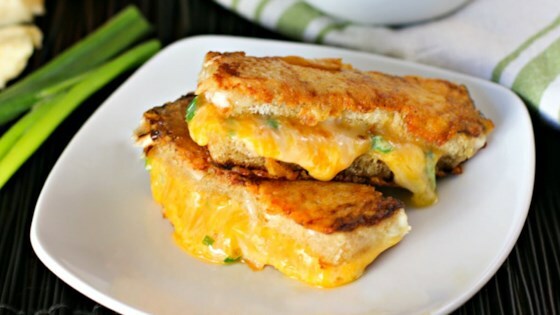 Top the Cheddar cheese mixture layer with the other slice of bread, so the Parmesan is on the outside of the sandwich. Cut sandwich into 4 equal slices. Heat a nonstick pan over medium heat; turn heat down to medium-low. Place sandwich sticks in the skillet and cook until golden brown and cheese is softly melted, 2 to 3 minutes per side.